What is the secret to a long-lasting marriage? The answer always seems to be a connection in the power of commitment. The commitment that goes beyond the decision or the feelings. Desire to be supported and encourage by other like-minded women? Join us at Women of IMPACT. http://facebook.com/groups/thewomenofimpact It's unfortunate in our culture today that marriage is not a priority. It stems more from a convenience or a privilege, a status. And if either party doesn't ... Más informaciones "feel" like the marriage is working, then the party quickly acts to dissolve the marriage. Just look at Hollywood. Why do you think this is? Have we become a society of "what's in it for me"? I think we have a choice beyond the WIIFM. And that choice goes beyond the decision to be happy and celebrate with a ceremony. It comes from the power of commitment. I've been blessed to be surrounded by many long-lasting marriages in my family. Now some would equate "long-lasting" to no worries or no problems. But that's not the case. Marriage takes work by both parties. And in the work, there must be commitment. Commitment: the state or quality of being dedicated to a cause, activity, etc. a pledge or undertaking. an engagement or obligation that restricts freedom of action. You could look at all of those definitions and apply them to marriage. But again, the question remains. 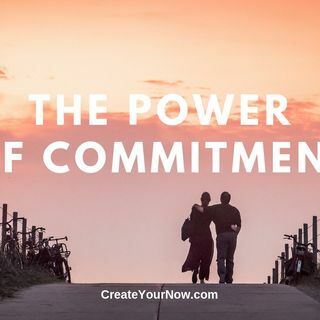 If the secret to a long-lasting marriage stems from the power of commitment, then how do you get that? You must enact the power of commitment. The K.I.S.S. ~ Enact the power of commitment! Too much of our actions in life support the WIIFM, "what's in it for me". We have to stop doing in order to get something. And what I mean by that is your actions in a relationship, in a marriage, requires you to act beyond yourself. You cannot expect to have a long-lasting marriage if you only think about you. "A commitment is the actions taken to support the joint decision within a relationship." ~ Kristianne Wargo COMMIT to the decision. You're in it for the long haul. This isn't about a one night stand or a convenient arrangement. COMMUNICATE your desires. You have to be open with what works for the two of you. It's not one size fits you. This is a two-way street. Be CONSIDERATE of your spouse. Forgive, let go, and move forward together. The power of commitment builds a strong foundation to withstand a crisis, chaos, and calamities. What are you doing to facilitate your commitment to your spouse? In other words, what are you doing to love more deeply? Be honest and think about if your marriage is wrapped around WIIFM. If that's the station running your marriage, it's time to change the station. We are called to mirror our marriage to God's relationship to us; unconditional love and grace --- The power of commitment. "Take aim today. Your marriage is worth it!" #RelationshipBuilders #CreateYourNow #LoveAndMarriage TAKE A.I.M. ~ Action Ignites Motivation - This is a complimentary (FREE) coaching call with me. You will be able to discuss your specific situation and gain tools and strategies to move you forward. Live. Love. IMPACT! "One step at a time leads to miles of greatness!" Subscribe to Create Your Now TV on YouTube. Wanting help with goals, setting your schedule, or need someone to talk to (even if you don't know what you need)? It's time you TAKE A.I.M. ~ Action Ignites Motivation. This is FREE for you. Stop trying to do it by yourself. Put YOU first! Become your best selfie so you can live your life's purpose. ANNOUNCEMENT: Ready to shine your light and tell your story. Please click on MY STRENGTH IS MY STORY. Here you can submit yourself to appear on the podcast or make recommendations as who you would like to hear. This is going to be a beautiful series! Subscribe to Create Your Now TV on YouTube. Listen to Create Your Now on Spotify. Listen to Create Your Now on iHeart Radio. Click here. The Create Your Now Archives are LIVE!! You can subscribe and listen to all the previous episodes here. http://bit.ly/CYNarchive1 and http://bit.ly/CYNarchive2 and http://bit.ly/CYNarchive3 and http://bit.ly/CYNarchive4 and http://bit.ly/CYNarchive5 Contact me at YourBestSelfie@CreateYourNow.com THE NO FUSS MEAL PLAN Instagram @CreateYourNow @Kristianne Wargo Twitter @KristianneWargo @CreateYourNow Facebook www.facebook.com/TheKISSCoach www.facebook.com/CreateYourNow PERISCOPE USERS!!! Click here for ANDROID Users / GOOGLE https://play.google.com/store/apps/details?id=tv.periscope.android Click here for APPLE Users https://itunes.apple.com/app/id972909677 Read more from Kristianne, a contributor to The Huffington Post, MindBodyGreen, Thrive Global, Addicted2Succes, and She Owns It. https://addicted2success.com/success-advice/5-things-to-do-while-waiting-for-success-to-manifest-in-your-life/ http://www.huffingtonpost.com/kristianne-wargo/ http://bit.ly/9amHabits https://journal.thriveglobal.com/how-to-configure-a-sleep-pattern-fit-for-you-d8edd3387eaf#.sniv275c3 https://sheownsit.com/when-failure-is-your-middle-name/ DOMESTIC BEAUTIES (Announcements) 1. Come and let's connect on Facebook - Women Of IMPACT http://facebook.com/groups/thewomenofimpact 2. Create Your Now ~ Your Best Selfie can be heard on iHeart Radio and Spotify! 3. Create Your Now Archive 1 is LIVE! You can subscribe and listen to all the previous episodes here. http://bit.ly/CYNarchive1 4. Create Your Now Archive 2 is LIVE! You can subscribe and listen to all the previous episodes here. http://bit.ly/CYNarchive2 5. Create Your Now Archive 3 is LIVE! You can subscribe and listen to all the previous episodes here. http://bit.ly/CYNarchive3 6. Create Your Now Archive 4 is LIVE! You can subscribe and listen to all the previous episodes here. http://bit.ly/CYNarchive4 7. Create Your Now Archive 5 is LIVE! You can subscribe and listen to all the previous episodes here. http://bit.ly/CYNarchive5 8. NEW Website! Go check it out and tell me what you think. http://www.createyournow.com 9. Sign Up for The A.I.M. Academy! You will be the first to learn all about it. http://createyournow.com/m-academy-2 10. Schedule a Discovery Call. This is a free 30-45 minute call for those serious about coaching with me. 11. Newsletter and Library: If you desire to get weekly emails, be sure to sign up here so you can stay connected. http://createyournow.com/library Cover Art by Jenny Hamson Photo by Stéphane Delval on Unsplash Music by Mandisa - Overcomer http://www.mandisaofficial.com Song ID: 68209 Song Title: Overcomer Writer(s): Ben Glover, Chris Stevens, David Garcia Copyright © 2013 Meaux Mercy (BMI) Moody Producer Music (BMI) 9t One Songs (ASCAP) Ariose Music (ASCAP) Universal Music - Brentwood Benson Publ. (ASCAP) D Soul Music (ASCAP) (adm. at CapitolCMGPublishing.com) All rights reserved. Used by permission.